The DIY mechanic working on their dearly beloved car that long ago pushed the odometer past any mentionable resale value might be looking online for a cheap way to repaint their car. Can they use their existing compressor? Maybe they could buy a cheap sprayer on e-Bay and give their car a fresh look? How small of an air compressor can you get by with when trying to paint a car? And how many CFMs do you need? It’s a fairly common question, and today we’ll dive deeper into the topic and help sort it out. There are very few compressors under 60 Gallons that can reach that kind of flow. And, without 60 gallons of reserve air, it is impossible to sustain that flow for any length of time. Even if you get a 60-gallon compressor, the motor and air pump might be too small to do a good job. Look carefully at their specifications or get the help of an air compressor comparison site like ToolTally.com to help make the decision more easily. Keep in mind that the larger compressor may require a 220-volt electric circuit. For Americans who mostly use 120-volt tools, that will likely mean wiring a new circuit into your shop. 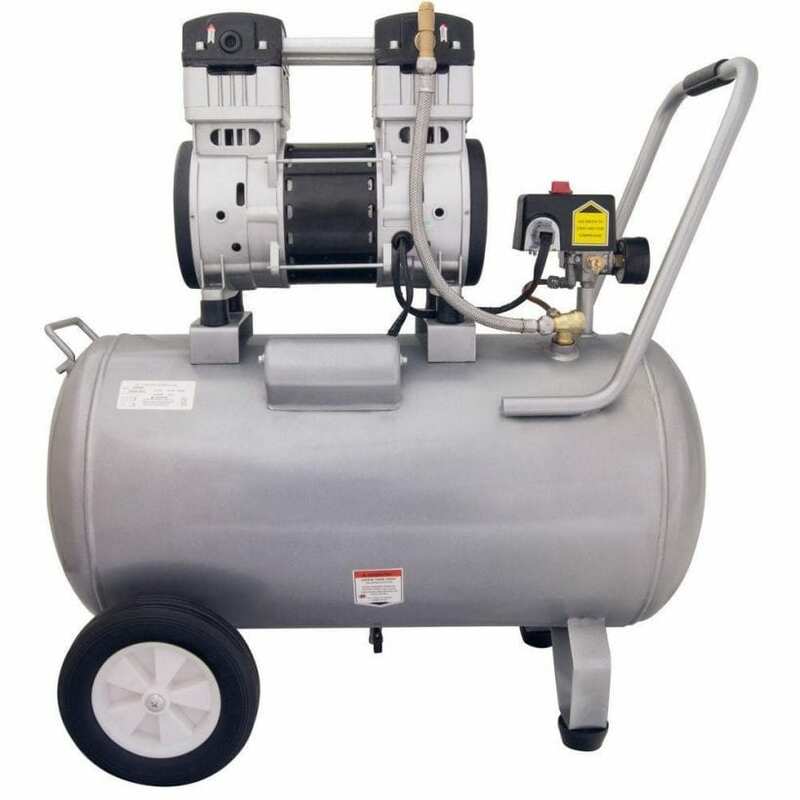 Most home shops, if they have a large compressor, only have one that is about 20 to 30 gallons. In theory, it could work, but the size of the paint job makes it difficult. 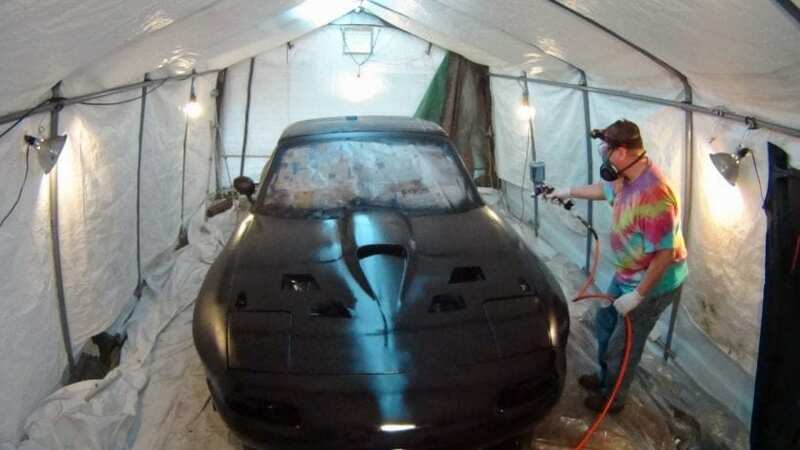 The bottom line is, when painting a car, you need a lot of air and a little bit of paint. High volume compressors need about 12 CFM. If you are using a compressor that can’t supply that air volume, your sprayer is going to struggle. First off, if you lack air flow, you’ll have to deal with spray delivery variations. When the tank is full and you start spraying, it will deliver nice, smooth paint layers. 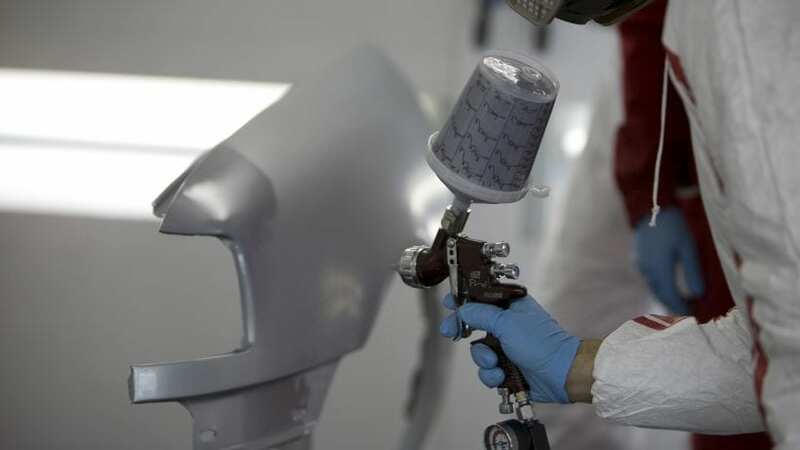 But as the compressor gets depleted, those clean spray patterns are harder to maintain and the width and thickness of the paint will vary, causing an uneven paint job. As you continue to fight low air volume, the sprayer may even clog, forcing you to take time to clean it and start again. Now, what if you could just lay down a few paths of paint, stop and wait for the compressor to recharge, and then start again? Aside from it taking forever to get the job done, you’ll likely have some drying that will occur between the different layers of paint, making the job look uneven with clear “lines” in the finished work. The spurts, the uneven lines, and the sprayer clogging issues aren’t worth the hassle. If you don’t have at least a 30-gallon air compressor and the patience of a saint, you’re probably better off leaving the car unpainted. Not to be a negative Nancy, but you are also going to run into condensation problems. The air that your compressor pulls in contains tiny bits of water in it. On a humid day, there is going to be more water collected for the volume of air compressed, but even on non-humid days, water is still present. As your compressor runs, it is going to be separating that water from the air. The water will mostly go to the bottom of the tank, but some of it will get into your lines. You’ll want to use an inline water separator (even on the properly sized tanks, you should be using a water separator), but even with a separator, you should drain your tank frequently to reduce the amount of water getting mixed into your paint spray. Bigger compressors don’t have to run as much because they compress more air with each stroke. They still get water problems, but not as badly. You might be able to get by with leaving the tank drain slightly cracked so the water can escape as it collects, but now you are sacrificing your already-precious air flow and stressing the motor further. However, with the right spray gun, you might be able to get around that. We’ll talk about spray guns, last, first, let’s make sure you aren’t about to cook your compressor. Few people pay attention to the air compressor’s duty cycles. So let’s talk about them. Most compressors these days use an oil-less configuration. This means that the pump is never oiled, and it does not have an oil reservoir. While this design lowers the maintenance needs, it also means that the compressor requires frequent rests because it does not have the added lubrication which helps to cool and prevent friction. We call the amount of time the compressor is running compared to the amount of time it is resting as the “duty cycle”. These oil-less units need a 50% duty cycle where it rests for as long as it runs. Some of them are at 40%, so they need to rest for longer periods than they run. Trying to paint with an undersized compressor could easily cause you to burn out the compressor. It is still possible to “cook” a compressor that has oil, but those typically have larger air outputs and longer duty cycles. If you had one with a 70% duty cycle, then it would only need to rest for 1/3 of the time that it was running. While it might be possible to paint your car with a smaller compressor, you will likely run into problems with the clear coat. The clear coat is much pickier about how it blends. It needs to be laid one evenly and pretty much all at once. 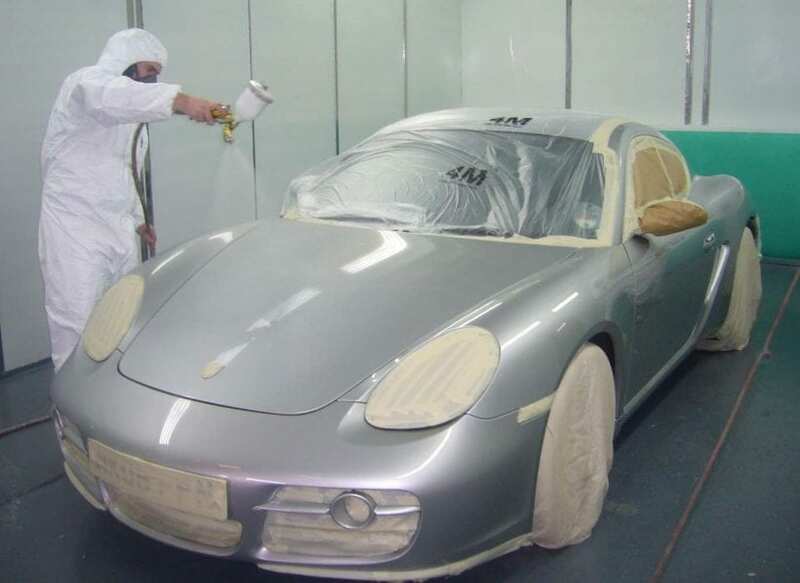 If you are taking time to let the compressor build back up, then by the time you begin spraying again, the clear coat will have begun to dry. Laying fresh clear coat over partially-dried clear coat gives you a very tacky, dull, lifeless appearance that will take a lot of buffing to resolve. The low volume low pressure – or LVLP – paint sprayer might be a great way to work around the limitations of your compressor. The downside with an LVLP is that create a more concentrated pattern so it might take longer to paint. They will require more material and may clog more. However, these can work pretty well for the clear coats where you want a more concentrated spray patter. If you are going with an LVLP tool, definitely spend a little more to get a better gun. Atom is a respected brand that makes some good ones. At the end of the day, you can paint your car with a lower pressure setup. Use the information we have given here and spend some time experimenting on some metal that is not your car (junk hood, anyone?). Then, when you are ready to paint, you’ll get the best possible job. After all, painting is one of those things that you learn by doing. And you have to start somewhere!